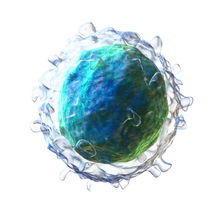 B cells, also known as B lymphocytes, are a type of white blood cell of the lymphocyte subtype. They function in the humoral immunity component of the adaptive immune system by secreting antibodies. Additionally, B cells present antigen (they are also classified as professional antigen-presenting cells (APCs)) and secrete cytokines. In mammals, B cells mature in the bone marrow, which is at the core of most bones. In birds, B cells mature in the bursa of Fabricius, a lymphoid organ. (The "B" from B cells comes from the name of this organ, where it was first discovered by Chang and Glick, and not from bone marrow as commonly believed). B cell activation occurs in the secondary lymphoid organs (SLOs), such as the spleen and lymph nodes. After B cells mature in the bone marrow, they migrate through the blood to SLOs, which receive a constant supply of antigen through circulating lymph. At the SLO, B cell activation begins when the B cell binds to an antigen via its BCR. Although the events taking place immediately after activation have yet to be completely determined, it is believed that B cells are activated in accordance with the kinetic segregation model, initially determined in T lymphocytes. This model denotes that before antigen stimulation, receptors diffuse through the membrane coming into contact with Lck and CD45 in equal frequency, rendering a net equilibrium of phosphorylation and non-phosphorylation. It is only when the cell comes in contact with an antigen presenting cell that the larger CD45 is displaced due to the close distance between the two membranes. This allows for net phosphorylation of the BCR and the initiation of the signal transduction pathway. Of the three B cell subsets, FO B cells preferentially undergo T cell-dependent activation while MZ B cells and B1 B cells preferentially undergo T cell-independent activation. B cell activation is enhanced through the activity of CD21, a surface receptor in complex with surface proteins CD19 and CD81 (all three are collectively known as the B cell coreceptor complex). When a BCR binds an antigen tagged with a fragment of the C3 complement protein, CD21 binds the C3 fragment, co-ligates with the bound BCR, and signals are transduced through CD19 and CD81 to lower the activation threshold of the cell. It has been also shown that CD20 is directly required for BCR signalling in B cells, and therapeutically used anti-CD20 antibodies such rituximab primarily eliminate the B cells that have a high potential for activation of the BCR signalling pathway . It has been recently described that BCR signalling and B cell activation is inhibited by p53 stabilization during DNA damage response . Now activated, B cells participate in a two-step differentiation process that yields both short-lived plasmablasts for immediate protection and long-lived plasma cells and memory B cells for persistent protection. The first step, known as the extrafollicular response, occurs outside lymphoid follicles but still in the SLO. During this step activated B cells proliferate, may undergo immunoglobulin class switching, and differentiate into plasmablasts that produce early, weak antibodies mostly of class IgM. The second step consists of activated B cells entering a lymphoid follicle and forming a germinal center (GC), which is a specialized microenvironment where B cells undergo extensive proliferation, immunoglobulin class switching, and affinity maturation directed by somatic hypermutation. These processes are facilitated by TFH cells within the GC and generate both high-affinity memory B cells and long-lived plasma cells. Resultant plasma cells secrete large amounts of antibody and either stay within the SLO or, more preferentially, migrate to bone marrow. As with TD antigens, B cells activated by TI antigens need additional signals to complete activation, but instead of receiving them from T cells, they are provided either by recognition and binding of a common microbial constituent to toll-like receptors (TLRs) or by extensive crosslinking of BCRs to repeated epitopes on a bacterial cell. B cells activated by TI antigens go on to proliferate outside lymphoid follicles but still in SLOs (GCs do not form), possibly undergo immunoglobulin class switching, and differentiate into short-lived plasmablasts that produce early, weak antibodies mostly of class IgM, but also some populations of long-lived plasma cells. Lymphoplasmacytoid cell - A cell with a mixture of B lymphocyte and plasma cell morphological features that is thought to be closely related to or a subtype of plasma cells. This cell type is found in pre-malignant and malignant plasma cell dyscrasias that are associated with the secretion of IgM monoclonal proteins; these dyscrasias include IgM monoclonal gammopathy of undetermined significance and Waldenström's macroglobulinemia. Memory B cell - Dormant B cell arising from B cell differentiation. Their function is to circulate through the body and initiate a stronger, more rapid antibody response (known as the anamnestic secondary antibody response) if they detect the antigen that had activated their parent B cell (memory B cells and their parent B cells share the same BCR, thus they detect the same antigen). Memory B cells can be generated from T cell-dependent activation through both the extrafollicular response and the germinal center reaction as well as from T cell-independent activation of B1 cells. Malignant transformation of B cells and their precursors can cause a host of cancers, including chronic lymphocytic leukemia (CLL), acute lymphoblastic leukemia (ALL), hairy cell leukemia, follicular lymphoma, non-Hodgkin's lymphoma, Hodgkin's lymphoma, and plasma cell malignancies such as multiple myeloma, Waldenström's macroglobulinemia, and certain forms of amyloidosis. A study that investigated the methylome of B cells along their differentiation cycle, using whole-genome bisulfite sequencing (WGBS), showed that there is a hypomethylation from the earliest stages to the most differentiated stages. The largest methylation difference is between the stages of germinal center B cells and memory B cells. Furthermore, this study showed that there is a similarity between B cell tumors and long-lived B cells in their DNA methylation signatures. ^ a b c d e f g h i j k l m n o p q r s Murphy, Kenneth (2012). Janeway's Immunobiology (8th ed.). New York: Garland Science. ISBN 9780815342434. ^ a b Cooper, Max D. (2015-01-01). "The early history of B cells". Nature Reviews Immunology. 15 (3): 191–7. doi:10.1038/nri3801. PMID 25656707. ^ a b Kondo, Motonari (2010-11-01). "Lymphoid and myeloid lineage commitment in multipotent hematopoietic progenitors". Immunological Reviews. 238 (1): 37–46. doi:10.1111/j.1600-065X.2010.00963.x. ISSN 1600-065X. PMC 2975965. PMID 20969583. ^ a b Pelanda, Roberta; Torres, Raul M. (2012-04-01). "Central B-Cell Tolerance: Where Selection Begins". Cold Spring Harbor Perspectives in Biology. 4 (4): a007146. doi:10.1101/cshperspect.a007146. ISSN 1943-0264. PMC 3312675. PMID 22378602. ^ a b Martensson, Inga-Lill; Almqvist, Nina; Grimsholm, Ola; Bernardi, Angelina (2010). "The pre-B cell receptor checkpoint". FEBS Letters. 584 (12): 2572–9. doi:10.1016/j.febslet.2010.04.057. PMID 20420836. ^ a b c LeBien, Tucker W.; Tedder, Thomas F. (2008-09-01). "B lymphocytes: how they develop and function". Blood. 112 (5): 1570–1580. doi:10.1182/blood-2008-02-078071. ISSN 0006-4971. PMC 2518873. PMID 18725575. ^ Loder, By Florienne; Mutschler, Bettina; Ray, Robert J.; Paige, Christopher J.; Sideras, Paschalis; Torres, Raul; Lamers, Marinus C.; Carsetti, Rita (1999-07-01). "B Cell Development in the Spleen Takes Place in Discrete Steps and Is Determined by the Quality of B Cell Receptor–Derived Signals". The Journal of Experimental Medicine. 190 (1): 75–90. doi:10.1084/jem.190.1.75. ISSN 0022-1007. PMC 2195560. PMID 10429672. ^ a b c Chung, James B.; Silverman, Michael; Monroe, John G. (2003-01-06). "Transitional B cells: step by step towards immune competence". Trends in Immunology. 24 (6): 342–348. doi:10.1016/S1471-4906(03)00119-4. ISSN 1471-4906. ^ Cerutti, Andrea; Cols, Montserrat; Puga, Irene (2013-01-01). "Marginal zone B cells: virtues of innate-like antibody-producing lymphocytes". Nature Reviews Immunology. 13 (2): 118–32. doi:10.1038/nri3383. PMC 3652659. PMID 23348416. ^ Harwood, Naomi E.; Batista, Facundo D. (2010-01-01). "Early Events in B Cell Activation". Annual Review of Immunology. 28 (1): 185–210. doi:10.1146/annurev-immunol-030409-101216. PMID 20192804. ^ Yuseff, Maria-Isabel; Pierobon, Paolo; Reversat, Anne; Lennon-Duménil, Ana-Maria (2013-01-01). "How B cells capture, process and present antigens: a crucial role for cell polarity". Nature Reviews Immunology. 13 (7): 475–86. doi:10.1038/nri3469. PMID 23797063. ^ a b c d e f g h i j Nutt, Stephen L.; Hodgkin, Philip D.; Tarlinton, David M.; Corcoran, Lynn M. (2015-01-01). "The generation of antibody-secreting plasma cells". Nature Reviews Immunology. 15 (3): 160–71. doi:10.1038/nri3795. PMID 25698678. ^ Asokan, Rengasamy; Banda, Nirmal K.; Szakonyi, Gerda; Chen, Xiaojiang S.; Holers, V. Michael (2013-01-01). "Human complement receptor 2 (CR2/CD21) as a receptor for DNA: Implications for its roles in the immune response and the pathogenesis of systemic lupus erythematosus (SLE)". Molecular Immunology. 53 (1–2): 99–110. doi:10.1016/j.molimm.2012.07.002. PMC 3439536. PMID 22885687. ^ Zabel, Mark D.; Weis, John H. (2001-03-01). "Cell-specific regulation of the CD21 gene". International Immunopharmacology. Unraveling Mechanisms and Discovering Novel Roles for Complement. 1 (3): 483–493. doi:10.1016/S1567-5769(00)00046-1. PMID 11367532. ^ Pavlasova, G.; Borsky, M.; Svobodova, V.; Oppelt, J.; Cerna, K.; Novotna, J.; Seda, V.; Fojtova, M.; Fajkus, J.; Brychtova, Y.; Doubek, M.; Pospisilova, S.; Mayer, J.; Mraz, M. (2018). "Rituximab primarily targets an intra-clonal BCR signaling proficient CLL subpopulation characterized by high CD20 levels". Leukemia. 32 (9): 2028–2031. doi:10.1038/s41375-018-0211-0. PMID 30030508. ^ Cerna, K.; Oppelt, J.; Chochola, V.; Musilova, K.; Seda, V.; Pavlasova, G.; Radova, L.; Arigoni, M.; Calogero, R. A.; Benes, V.; Trbusek, M.; Brychtova, Y.; Doubek, M.; Mayer, J.; Pospisilova, S.; Mraz, M. (2018). "MicroRNA miR-34a downregulates FOXP1 during DNA damage response to limit BCR signalling in chronic lymphocytic leukaemia B cells". Leukemia. 33 (2): 403–414. doi:10.1038/s41375-018-0230-x. PMID 30111844. ^ Blum, Janice S.; Wearsch, Pamela A.; Cresswell, Peter (2013-01-01). "Pathways of Antigen Processing". Annual Review of Immunology. 31 (1): 443–473. doi:10.1146/annurev-immunol-032712-095910. PMC 4026165. PMID 23298205. ^ a b c d Crotty, Shane (2015-01-01). "A brief history of T cell help to B cells". Nature Reviews Immunology. 15 (3): 185–9. doi:10.1038/nri3803. PMC 4414089. PMID 25677493. ^ MacLennan, Ian C. M.; Toellner, Kai-Michael; Cunningham, Adam F.; Serre, Karine; Sze, Daniel M.-Y. ; Zúñiga, Elina; Cook, Matthew C.; Vinuesa, Carola G. (2003-08-01). "Extrafollicular antibody responses". Immunological Reviews. 194: 8–18. doi:10.1034/j.1600-065x.2003.00058.x. ISSN 0105-2896. PMID 12846803. ^ a b Shlomchik, Mark J.; Weisel, Florian (2012-05-01). "Germinal center selection and the development of memory B and plasma cells". Immunological Reviews. 247 (1): 52–63. doi:10.1111/j.1600-065X.2012.01124.x. ISSN 1600-065X. PMID 22500831. ^ a b Bortnick, Alexandra; Chernova, Irene; Quinn, William J.; Mugnier, Monica; Cancro, Michael P.; Allman, David (2012-06-01). "Long-Lived Bone Marrow Plasma Cells Are Induced Early in Response to T Cell-Independent or T Cell-Dependent Antigens". The Journal of Immunology. 188 (11): 5389–5396. doi:10.4049/jimmunol.1102808. ISSN 0022-1767. PMC 4341991. PMID 22529295. ^ a b c d e McHeyzer-Williams, Michael; Okitsu, Shinji; Wang, Nathaniel; McHeyzer-Williams, Louise (2011-01-01). "Molecular programming of B cell memory". Nature Reviews Immunology. 12 (1): 24–34. doi:10.1038/nri3128. PMC 3947622. PMID 22158414. ^ a b c d Kurosaki, Tomohiro; Kometani, Kohei; Ise, Wataru (2015-01-01). "Memory B cells". Nature Reviews Immunology. 15 (3): 149–59. doi:10.1038/nri3802. PMID 25677494. ^ Ribourtout B, Zandecki M (2015). "Plasma cell morphology in multiple myeloma and related disorders". Morphologie : Bulletin de l'Association des Anatomistes. 99 (325): 38–62. doi:10.1016/j.morpho.2015.02.001. PMID 25899140. ^ a b c d Baumgarth, Nicole (2010-01-01). "The double life of a B-1 cell: self-reactivity selects for protective effector functions". Nature Reviews Immunology. 11 (1): 34–46. doi:10.1038/nri2901. PMID 21151033. ^ Pillai, Shiv; Cariappa, Annaiah; Moran, Stewart T. (2005-01-01). "Marginal Zone B Cells". Annual Review of Immunology. 23 (1): 161–196. doi:10.1146/annurev.immunol.23.021704.115728. PMID 15771569. ^ a b c d e Rosser, Elizabeth C.; Mauri, Claudia (2015). "Regulatory B Cells: Origin, Phenotype, and Function". Immunity. 42 (4): 607–612. doi:10.1016/j.immuni.2015.04.005. ISSN 1074-7613. PMID 25902480. ^ a b Yanaba, Koichi; Bouaziz, Jean-David; Matsushita, Takashi; Magro, Cynthia M.; St.Clair, E. William; Tedder, Thomas F. (2008-06-01). "B-lymphocyte contributions to human autoimmune disease". Immunological Reviews. 223 (1): 284–299. doi:10.1111/j.1600-065X.2008.00646.x. ISSN 1600-065X. PMID 18613843. ^ III, Arthur L. Shaffer; Young, Ryan M.; Staudt, Louis M. (2012-01-01). "Pathogenesis of Human B Cell Lymphomas". Annual Review of Immunology. 30 (1): 565–610. doi:10.1146/annurev-immunol-020711-075027. PMID 22224767. ^ Castillo JJ (2016). "Plasma Cell Disorders". Primary Care. 43 (4): 677–691. doi:10.1016/j.pop.2016.07.002. PMID 27866585. ^ Kulis, Marta; Merkel, Angelika; Heath, Simon; Queirós, Ana C.; Schuyler, Ronald P.; Castellano, Giancarlo; Beekman, Renée; Raineri, Emanuele; Esteve, Anna (2015-07-01). "Whole-genome fingerprint of the DNA methylome during human B cell differentiation". Nature Genetics. 47 (7): 746–756. doi:10.1038/ng.3291. ISSN 1061-4036. PMC 5444519. PMID 26053498.